Here it is. The home I was telling you about last week. That I gave you snippets of on several occasions. This is not a foreclosure, not a short sale. It's just a (mostly) untouched 1968 ranch style beauty. 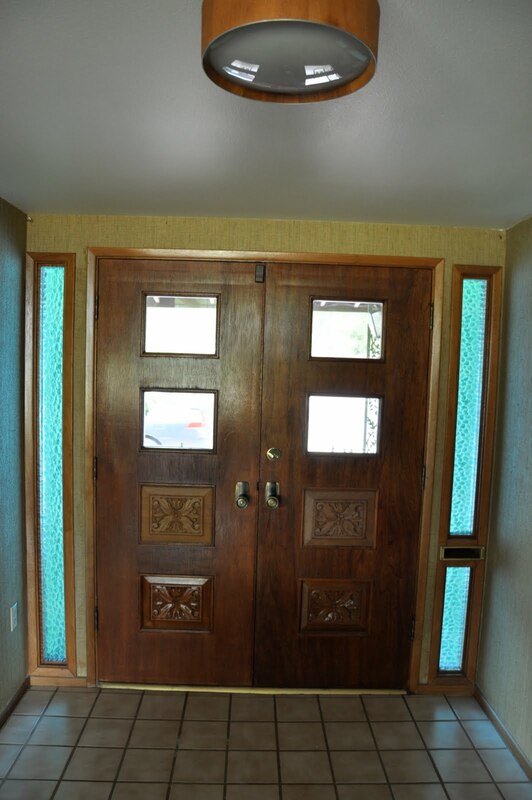 The carved door in the foyer (there's that light!) surrounded by blue side panels. A better view of the golf course right out the back door. The living room off the family room. A entire rock wall fireplace and more views of the golf course. Parquet flooring in the bump out area. A view from the living room back towards the family room. 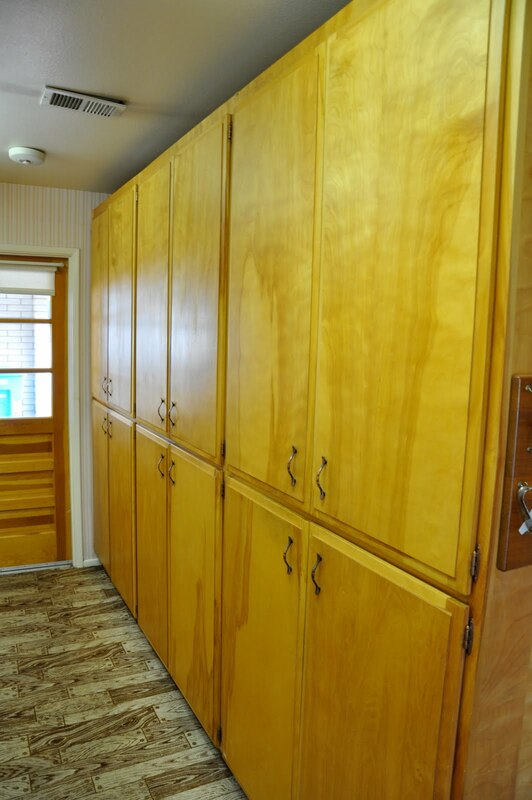 Built in book cases, real wood paneling. The paneling covers the entire wall to my left. Standing in between the living and family rooms, looking back towards the kitchen (foyer to the right). Two things to take note of: the rock waterfall looking plant holder and holy cow look at that loooong counter top pass through to the kitchen! That's the longest expanse of pink tile I have ever seen! 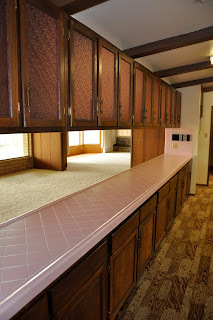 And the pink tile just keeps going, wrapping around the whole kitchen! Original curtains as well. Pink plastic inserts in the upper cabinets. Built in intercom system. This house has all the latest gadgets, at least for 1968! 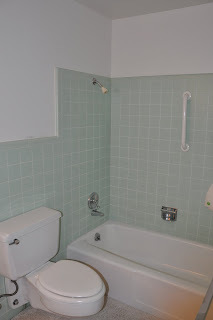 On to the master bathroom and it's original green tile. 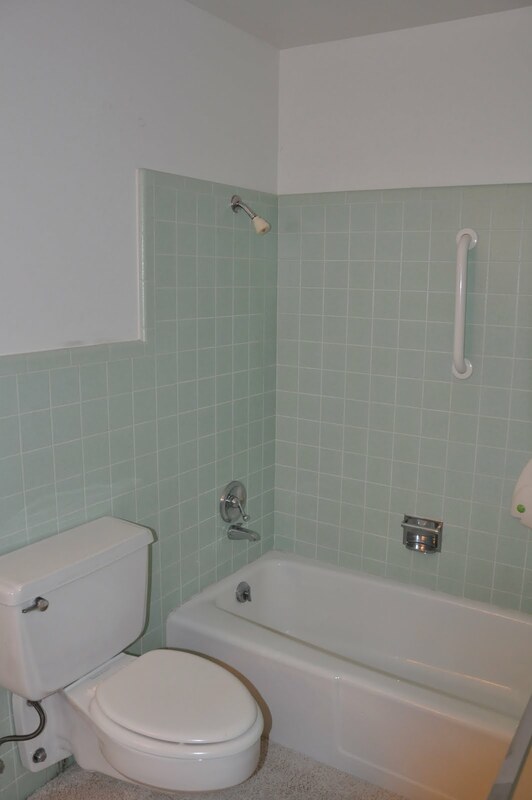 They added a grab bar and shower head. Check out the floating toilet! The counters in the master bath. Original medicine cabinet and light. One of the secondary bedrooms with wood paneled walls and a built in, drop down, desk. But wait, there's more! 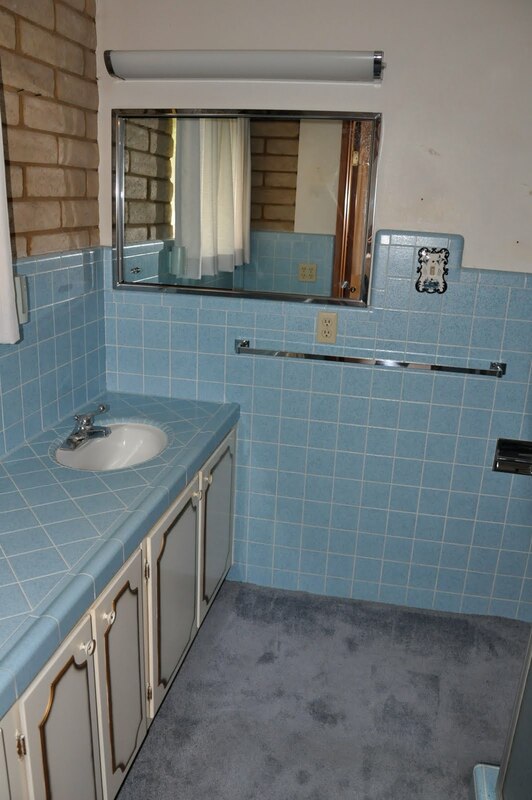 There's a second, jack and jill bathroom between two of the other bedrooms. And it's all blue tile. 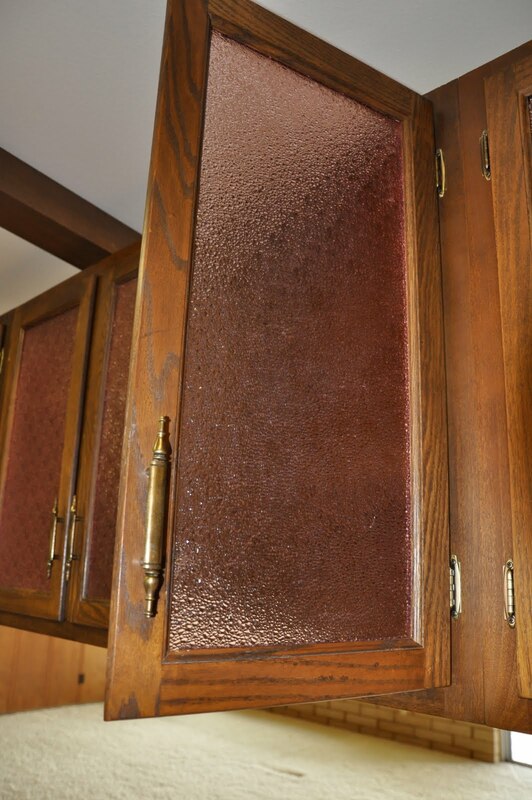 Original medicine cabinet and light. 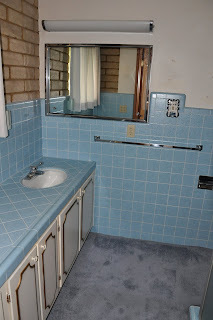 Last, but definitely not least, the laundry room. 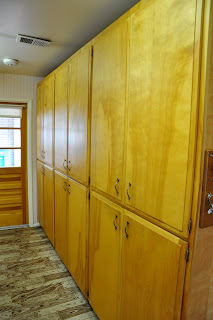 Gorgeous cabinets from floor to ceiling along the entire wall. There now, didn't I say it would be worth the wait? I keep hoping and praying that whoever ends up buying it keeps it pretty much the same. Obviously the carpeting in the main rooms is not original, but with parquet flooring in the bump out of the living room, there's at least a possibility of it being underneath the carpet. Without pulling it up though, I can't say for sure. Having said all that, this home has been sitting on the market for 163 days now. It was originally priced in the low $400s, but is now down to $370,000. I think the problem is that it's too expensive for most flippers to want to take on (that's a good thing!) and a lot of people who would want to live on the golf course don't necessarily like the vintage feel of it. 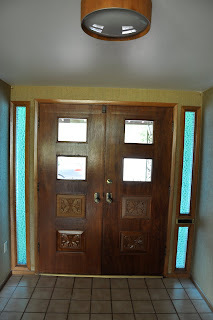 I can only hope some vintage lover out there spots it and snaps it up before it's too late and we lose yet another beautiful home to the virus known as "flipper beige". Its my space age bachelor pad!! !